This evening we were playing in the family room and I picked her up and put her on her feet. She started to take steps. This may be reflexive but none the less it is movement! Zack started to run away fromher and she started stepping faster towards him so we started the game of chase! It was so cute! She was laughing, Zack was laughing, and mommy was almost in tears! She stood in her walker for almost 30 min while watching her sing along video! This is also fairly new! She has been really into the TV and of course she still loves her music in the car! I put her to bed early tonight because of her lack of a nap! I went into her room to fill I her bag with formula and knocked over a bottle! Of course she rolled over wided eyed! I picked her up and she was really wiggly so I layed her back down and she went back to sleep all on her OWN!!! She has done these a few time lately! I am very excited she is healing and becoming more able to comfort herself! This is soooo big! Thank You JESUS! There is a prayer below that is so relevent for our family. Taking care of Makenzie is a 24 hour a day job and fitting everything else in is soooo hard! I am trying so hard to be the best mother, OT, PT, and speech therapist, driver, doctor, maid, cook, and the list goes on! This has been a large source of guilt for the last year! Please pray for our family to be able to meet each others needs and all of the many needs of Makenzie's rehab at the same time! All your sons will be taught by the LORD, and great will be your children's peace." 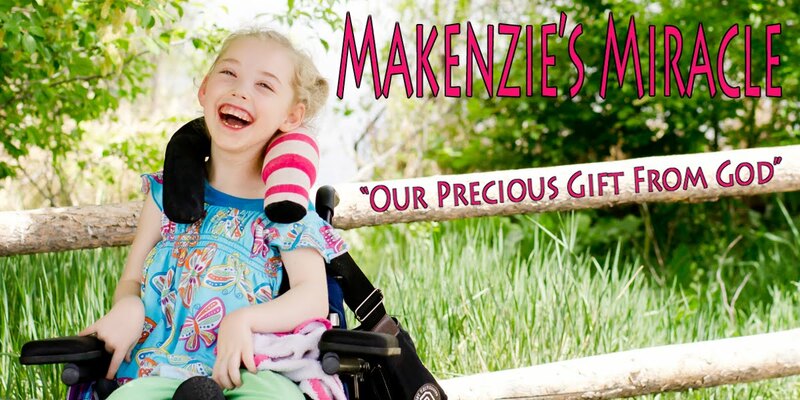 So much of our time and effort seems to go to Makenzie because of her many deep needs. But we are very mindful that our other children also have many deep needs. Our family's situation can often present them with special and difficult situations as well. They may often feel that what they are needing often goes unacknowledged or unmet. We often feel stretched and unable to do all that needs to be done for each child in our home. Help us to have great wisdom in knowing how to balance our focus and attention among our children to the best of our ability. We thank you, Lord, that we are not alone in ministering to our children, and that you care very deeply for each one. When we are unable to meet all of their needs, we pray that you would move deeply within them to bring comfort and peace to their hearts. Even in their youth we ask that you would give them great wisdom and ability to deal with their challenges in ways that will be productive. We ask that you would also give them an extra measure of hope for their futures and faith in you to provide all they need. Keep praying for our beautiful lillte girl! She has come so far and has so far to go but God is present and we feel so blessed! Thank You all for your support through all of this!